In society we still prefer children to be seen, and not sad, and we find films like A Monster Calls hard to watch. It forces us to confront the all too real experience for 50,000 newly bereaved children each year in the UK. This thought-provoking film brings alive the reality of a palliative diagnosis in a family. We feel this nightmare through the lens of Conor (Lewis MacDougall), aged 12. A beguiling intuitive mother (Felicity Jones) wants only to protect her son from her inevitable death. At times she stands confusingly positive, yet full of warmth and love. Her own mother is less warm, and disciplined (Sigourney Weaver). Conor simply longs for a secure home with his absent father (Tobu Keball), who has established a new family life in the US. The happy ever after narrative has to be re-woven, as his father is not going to be his guardian – so Conor has to learn to love his not-so-wicked grandmother differently. These subtle cognitive sub-plots of attachment and secondary loss make this film authentic to me, as someone who has listened to bereaved children for 25 years. A Monster Calls (at a 12A certificate) may get criticised as being too scary for children. I believe most children can tolerate and respect reality much more than protective adults realise – however they would need a sensitive adult to debrief them. It may also get criticised as too much fantasy animation for adults. But fairy tales and metaphors are flexible vehicles to handle the most complex of psychological challenges. The death of a parent is the most fundamental loss a child will ever face, but to achieve high viewing figures it is usually presented in more acceptable ways (such as in the film Stepmom). The young boy in that film facing his mother’s expected death is far removed from Conor – sweet, happy and lovable. Conor is all these things too: however, his much more complete character showed us the reality that we see in many unreachable teenage boys, who go on to develop disturbing psychological challenges to manage their unresolved grief. The film constantly wrestles and acknowledges the frustrating ‘splits’ that break up a child’s landscape as they walk on the swampy ground of anticipatory grief. Throughout the film, the subtle impact on identity, on confidence, and on the silence that can circle around a bereaved teenage boy in particular, is exquisitely portrayed on screen. It is films like this that will help us to go beyond ‘fine’ for teenage boys who struggle to talk. Boys are often deeply sad with a cold anger that is much more difficult to reach than girls. They are happy to be ignored, and hate to be different. It doesn’t mean they don’t need support. As professionals or volunteers – often female – we frequently feel rejected by their silence and anger. It takes real skill to create engaging peer support programmes that are appealing to teenage boys. Yet the consequences of how childhood grief is expressed has profound longer-term consequences in society. Our prisons and secure mental health units are littered with lives that have been ruined by the complexities of grief in childhood. Sadly, so many of their narratives, largely buried, can be tracked back to complex unresolved childhood loss. 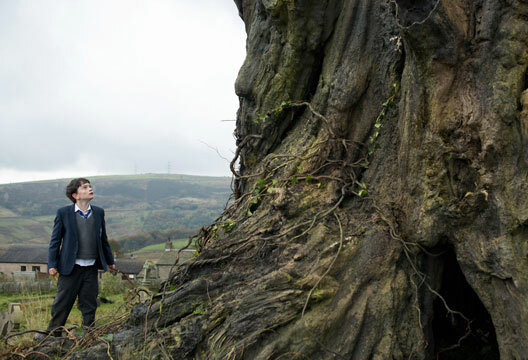 A Monster Calls needs to be on the curriculum for anyone who works with loss in children and young people. As I watched, I was imagining how this film could support a whole module for students on understanding how to reach a young person withdrawing into a dark and dangerous world of complex grief. The screenplay somehow covers every nuance that research has taught us about the impact of serious illness on family life. I hope those who invested in this film creatively and financially will realise the gift they have given to those people who really want to connect with male teenage grief. As we increasingly talk about suicide being the number one killer of young men, we also need to realise that unresolved loss is frequently a source of suicidal ideation. I hope the child bereavement field will use this film for decades to come in training other professionals and volunteers. - Reviewed by Julie Stokes OBE, Executive Coach and Founder, Winston’s Wish, the charity for bereaved children.